Here is a video I put together to help with replacing the shims. The best advice I can give is to take the riving knife off, take the rails off altogether, turn over the assembly onto a towel or cardboard box, flip the saw over on it’s top onto some cardboard, remove the side panels, remove the back panel, dust cover, and then you should have enough access to the screws and guide holder. I would stay away from using power tools for the rest of the assembly. The screw heads seem to be softer than I would expect so be careful not to strip them. For good measure pick up a couple spare: don’t ask me why I know! 8-32 X ¾” Pan head Machine screw. 10-24 x 1” Pan head Machine screw. To avoid much frustration when it comes time to get the shims to stay put as you are assembling it I suggest using painter’s tape on the top tabs of each flat shim and both top and bottom for the angled shims. The material I have made the shims out of is, in my opinion, more resilient so you should not see the problem happen again where the shim will eventually drop out. See the video for placing the shims frustration free. Tighten down the screws slowly, be patient. Once the bearing is seated all the way in the bracket you can then place the smaller screws into the black bearing holder plate with little frustration. I highly suggest that you use some form of dust collection to keep the build up from wedging the shims. MDF is particularly a problem because of the quantity of fine dust that is generated. Also, whenever I change the blade or take it out for cleaning I take the time to inspect the area to ensure that everything is working fine and that no build up is threatening the shims. I think that the original shims are particularly damaged at the end of travel of the lift mechanism. Be careful when approaching these limits. It would be great if you find something that helped you greatly I would love to hear about it. If you got here directly and don’t know where to get the shims: I sell the shims on the right here on my website, both a full set and just the angled ones. A good tear down video of a BT3100 which is very similar to the BT3000 except that it uses the thicker black shims. I sell the shims on the right here on my website, both a full set and just the angled ones. This picture shows the difference between new BT3100 shims on the left and old BT3000 shim on the right. They are not interchangeable. You can upgrade the saw to use the newer shims but you would have to find a replacement part for the guide holder (0181010110). I have heard there is mixed results with this approach. 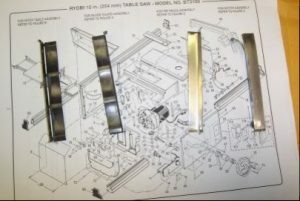 Flat shims for the BT3100 are listed as the same part number as the BT3000 and referenced as the shims for the BT3000.